I received this box some time ago, but I'm currently playing catch-up with posts. The complete Ornate Winter 2012 collection (the first time I've ordered an entire collection from Zoya), along with Zoya- Arizona, which was sort of a subconscious lemming of mine. The Remove + and Exotic Mango Sugar Scrub were extra freebies I received for ordering a certain amount, I think. Remove + is pretty good, and my flipper bottle was getting low, so I'm happy about that. Haven't tried the Sugar Scrub yet. Bottle Shots! This collection is so cohesive- they just look so tasty next to each other! These guys are so much prettier in person! Here is Butter London- Two Fingered Salute, one of three recent Nordstrom-exclusive polishes (and the most backordered). Most nails have two coats, but I needed three to cover thin patches on the ring finger. More about that later. Two Fingered Salute is a muted sage green base (very mermaid-y) with small coppery-pink flakie shimmer particles that flash in the light. This is a really unique color! Unfortunately, there was hardly any sun when I swatched this, so the copper shimmer is not as evident in my photos as it is in real life. However, it's definitely apparent- this is not a 'secret shimmer' polish! The V sign...has long been an insulting gesture in England, and later in the rest of the United Kingdom ... It is frequently used to signify defiance (especially to authority), contempt, or derision. So this is quite a cheeky polish name! This family of colors tends to give me lobster hands, but for some reason Two Fingered Salute does not, so I'm pretty pleased about that! The bottles are deceiving! Two Fingered Salute's muted base color is actually the most similar to OPI- Mermaid's Tears, as you will see in the next photo. It's slightly dustier than Mermaid's Tears, though- if you can believe that. I tried a few different free-hand painting designs, but none came out the way I wanted. (I especially like the designs that span across multiple nails.) 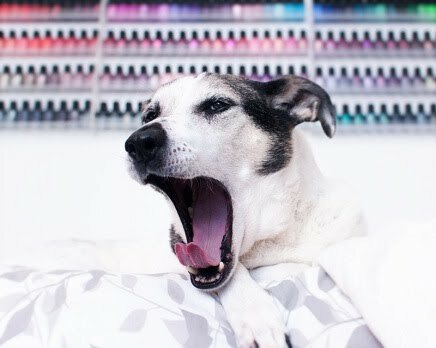 Nail art fails are so frustrating! So, I defaulted to stamping. I knew I had some Bundle Monster plates with Halloween images. I used plates BM-211, BM-222, & BM-224. For my thumb and pinkie, I taped off triangular areas down the length of the nail, and then used Nfu Oh- 50 to create a wedge shape. After removing the scotch tape, I used some purple striping tape to outline the wedges. Look how awesome China Glaze- Smoke And Ashes (base color) looks in the bottle, and how the blue-green shimmer is nonexistent on the nail! Disappointing, really. The Hound has located a delivery! Hooray! Guys, this box contains one nail polish. ONE. My dog weighs fifty pounds. Let's do a size comparison, shall we? Well, mine finally came, and I'm anxious to wear this! It's a muted sagey-mermaid green with copper/pink flakey shimmer! Ah! Stay tuned- swatches to come! The base color is in the pink (or maybe really warm lavender) family, but it's sort of muted in a mauve-y sort of way. The holographic effect usually only shows up in sunlight for me, not artificial lighting (flash), so the fact that I could already see rainbows here was a good sign! It's another very, very strong linear holo! I am not disappointed. Look at the rainbows in that bottle! Formula: The formula on this was amazing for a holographic polish- about the same experience as Harp On It. Like Harp On It, though, it's prone to bubbling if you apply coats that are too thick. Just something to keep in mind. I should also mention that I used topcoat (INM's Out The Door) with both of these Color Club polishes, and the holographic effect was not diminished! That's a huge bonus for me, because I love me a quick-dry topcoat. I didn't swatch these on real nails because they're quite different, but I thought some people might like to see a side-by-side anyway. Mail-time: Color Club Halo Hues Holographics!